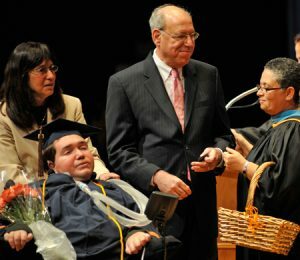 When Eyal Sherman crossed the stage to receive his Syracuse University diploma at the University College Commencement Celebration in May, 2009, the world was watching. Dateline NBC covered this momentous occasion, not because Eyal is rich or famous or accomplished, but because his life story is one of extraordinary triumph over inconceivable odds. The fact that he cannot walk, talk, or even breathe on his own is almost incidental. A ventilator breathes for him 24 hours a day. “He always understood, even with his challenges, that he would be a college graduate,” his father, Rabbi Charles Sherman of Temple Adath Yeshurun in Syracuse asserts. Eyal’s determination to reach beyond his disabilities is so strong that he was the subject of a research project at SU under the direction of Ed Lipson, Ph.D., a professor in the department of physics at SU. The project focused on creating communication devices for individuals with significant physical challenges. He was also the recipient of a scholarship from SU’s Burton Blatt Institute, which advances the civic, economic, and social participation of persons with disabilities At age 28 Eyal received a Bachelor of Arts degree in Fine Arts from The College of Arts and Sciences, with special distinction as a UC Alumni Scholar. As a Fine Arts major, Eyal pursued an interest in and talent for painting, which he achieves by gripping a paintbrush between his teeth. “He has sold numerous paintings,” his father points out. The support Eyal received as he worked toward his degree involved more than family. The Office of Disability Services at SU worked with the Sherman family to ensure that classrooms were accessible, classes were appropriate, and parking was available. But it was at University College that Eyal found an extended family that mirrored the commitment of his family of origin. “I don’t think this could have worked anywhere but University College,” Sherman reflects.